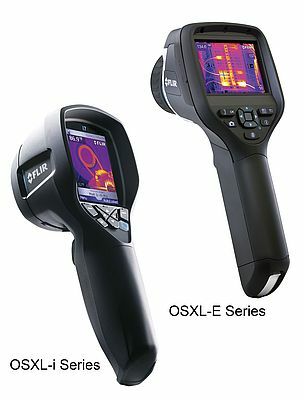 The OSXL-I series (FLIR I Series) is a compact, lightweight, point-and-shoot camera with an easy-to-use focus-free lens offered by Omega. This CE compliant product stores up to 5000 jpeg images with a convenient thumbnail image gallery. The device is easier, faster and safer to use than infrared thermometers, and far more accurate. The 71mm LCD colour display makes it easy to read images and temperature data to help find wasteful energy loss, locate moisture damage, document repairs, detect energized equipment, minimise downtime and more. Ideal for HVAC, Automotive, Electrical and Building Inspection.